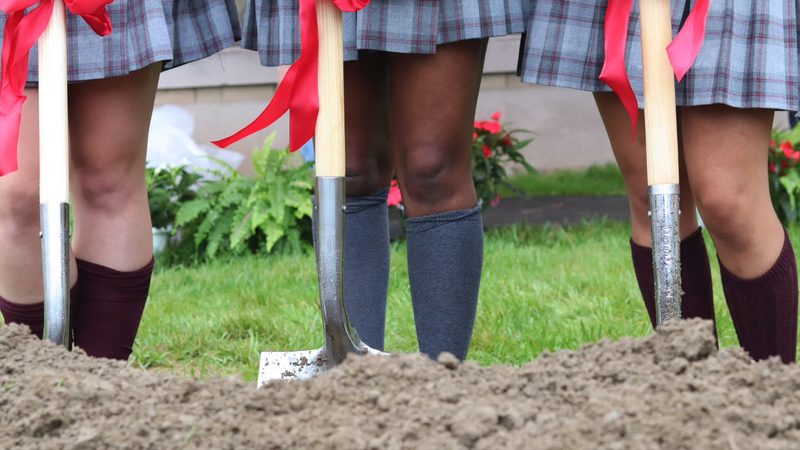 On Friday, June 1, we broke ground for our new School Center. More than 400—including students, faculty and staff, alumnae, advisory council members, campaign cabinet and committee members, Sisters, and invited guests—joined us for First Friday Mass followed by the blessing and groundbreaking ceremony. Sacred Heart Academy is a true community, a home away from home. Phase I of Ever Higher is all about enhancing this sense of community by building a new wing that will be an educational, social, and cultural hub. This new wing is so much more than bricks and mortar. From the striking new entrance with top-notch security, it will serve as the true heart of our school. The new wing, or student center as we refer to it as, will feature new offices for the president, principal, admissions and alumnae, including an alumnae board room which will house precious reminders of our heritage. In addition, a much needed student commons where students can gather and where the kismet of students bumping into each other will encourage spontaneous collaboration and generate ideas, projects and activities. This new school center will truly be the hub of the school. The benefits of this new wing will be greater than its individual parts. The school center will improve security with a single, properly monitored entry point. It will support admissions, providing a welcoming experience for prospective families. And, as the school’s heart, it will enrich our culture and sense of community by improving accessibility for those who are disabled. "We plan to build a space that will allow us to keep pace with the changing academic climate of the 21st century, and that will enhance the sense of community that is central to our mission." John F. Buckley, Jr., Esq.